Prolonged periods of service in Iraq and Afghanistan are putting the armed forces at risk of psychological problems, UK research has suggested. A study of 5,500 regular troops found that about 20% were on tour for longer than recommended. And long deployments were found to be associated with an increased risk of post-traumatic stress disorder (PTSD), the British Medical Journal reported. They calculated that those deployed for over the average recommended amount of 13 months or more in a three-year period were 20-50% more likely to have symptoms of PTSD. General health and severe alcohol problems were also associated with long periods in a war zone. The findings were particularly apparent in personnel with direct combat exposure. A mismatch between the expected length of deployment and the reality was also associated with higher risk of PTSD. Around one in 10 who took part in the research said they had been away longer than they expected. Professor Roberto Rona, an expert in public health and study leader said: "The prevalence of all psychological symptoms was higher among those deployed for 13 months or more. "Our results indicate that adherence to a clear and explicit policy on duration of each deployment may have beneficial effects on mental health." Matthew Hotopf, professor of general hospital psychiatry at Kings College London, said the impact of deployments longer than a year was significant. He added: "If you go above that cut-off point you see an increase in things like PTSD, anxiety and alcohol problems." Royal British Legion welfare director Sue Freeth told the BBC's Breakfast programme mental health problems in veterans often remained hidden until they had left the services. She added: "Often they wait too late for help, so then they may be in other circumstances - their family has broken up, they've lost their home, they may have lost their first job." Ministry of Defence figures show the number of new cases of mental disorders, of all types and regardless of cause, in the first quarter of this year was 0.58% and the rate of new cases of PTSD was 0.03%. Under-secretary of state for defence Derek Twigg stressed these rates were very low, but welcomed the new research, which he hoped could help bring them down further. He added: "We recognise mental illness as a serious and disabling condition and we want to ensure that our people have the best possible mental health support. "We have taken great steps to raise awareness and to reduce the stigma associated with mental illness. "These include pre-and post-deployment briefing and the availability of support, assessment and, if required, treatment - both during and after deployments. "We are studying the research to see how we can reduce even further the number of troops who suffer from mental illness." He added that troops were stretched but not overstretched and the vast majority are on operations for no longer than six to seven months. 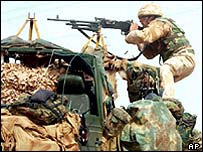 Liam Fox, Shadow Defence Secretary, said the Armed Forces were being asked to do too much with too little resource. He added: "Military psychiatry has been run-down by Labour and farmed out to private contractors. "Unsurprisingly big gaps have opened up, particularly in relation to the Territorial Army and veterans who may become unwell as a result of their service years after leaving the Forces."